These Monotype fonts include the Stranger Things typeface. Accessing a wealth of font styles has just got easier for Creative Cloud customers thanks to hundreds of new additions from Monotype. 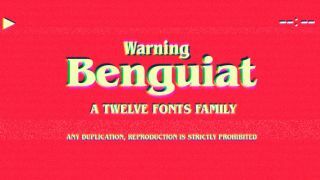 With over 665 new fonts from 41 different type families, including retro fonts such as ITC Benguiat seen in smash-hit Netflix series Stranger Things (pictured above) there's plenty here to enjoy in this Adobe update. Many of the fonts in this collection were designed in the twentieth century and had a huge impact upon their release. In fact, many have gone on to inspire popular variations over the years, so having the source material on hand is sure to be a welcome extra to type designers' toolkits. As well as launching these new fonts, Adobe will also soon release type innovation tools for Illustrator CC and InDesign that will allow users to seamlessly browse, filter and sort through the roughly 9,000 fonts on Adobe Typkit without the hassle of having to leave their canvas. As there's nearly 700 additional fonts to choose from in this update, we won't run through them all. Instead, we've rounded up some of the standout fonts for your browsing pleasure below, simply click left to right through the gallery with the arrows. You can browse the entire collection here.